One of the biggest disappointments for photographers last year was Apple’s decision to discontinue its popular Aperture software. For nearly 10 years, Aperture along with its rival Lightroom had created and pushed forward the concept of easy image management. Whilst Adobe came through with a promise to create an Aperture to Lightroom plugin, Apple teased us, ever so slightly, with a new product, Photos. Now that product has hit public beta and we are going to take a brief look at it. As it is a beta, rather than give an opinion, this article will look at some of the feature that should make it into the final version. 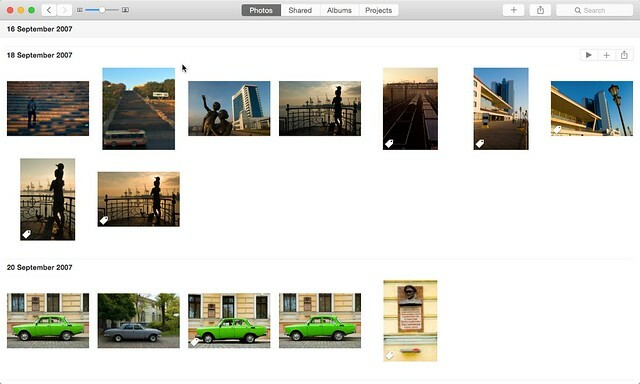 Photos is installed as part of the latest Yosemite 10.10.3 beta update via the App store. To get it, you need to sign up for Apple’s public beta program which is free. Once installed, users of IOS products will be instantly familiar with the dock icon. It is very similar to the IOS Photos app, a nudge towards the continuing convergence of IOS and OS X. 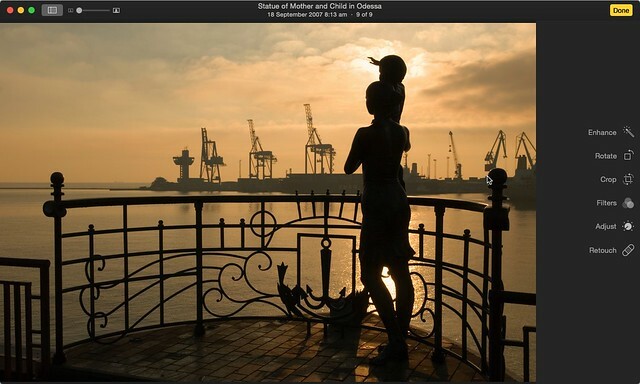 Once open, you will be prompted to import some images into a Library, in much the same way as Aperture or iPhoto. Photos by default creates your library in the Picture folder but also has the option to sync them in iCloud. Interestingly as of yet, I see no way to reference images in their current location, Photos instead imports them directly into the catalogue and keeps the originals in place. This might be an important space consideration for Macbook Pro and Air users. Once imported, you images show up in the main Photos window. This is a minimalist design with thumbnails displayed on a pure white background. The selected photo is highlighted with a blue keyline around it. At the top of the window are four tabs. Photos, the actually catalogue element of the software, Shared, this is the iCloud integration, Albums, this allows you to create different albums based on images you have imported and also has default albums contained face recognised images, panoramic and last import. Lastly Projects allows you to create books, calendars and other sundry items based on your photos and albums. Of course the most important element of any app like Photos is its editing abilities. A selected image in the Photos tab can be edited by double clicking it and selecting Edit from the top right of the full image view. 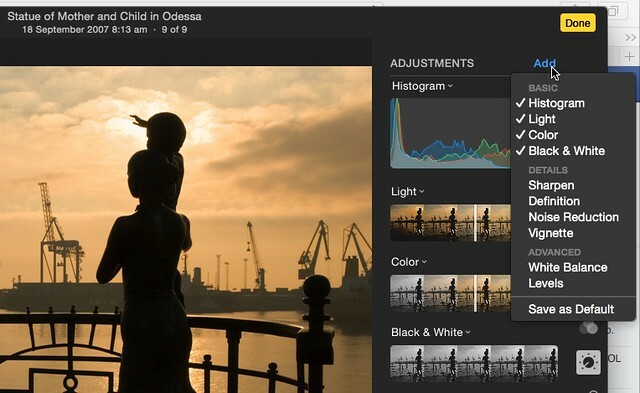 This will open the editing options which are in order, Enhance, Rotate, Crop, Filters, Adjust and Retouch. Lets have a quick look at them. Enhance: This is an auto adjustment tool. Clicking it will optimize the exposure, contrast and color of your image. Rotate: Clicking Rotate will turn the image counter clockwise only. To do a clockwise rotation you need to right click and select Rotate Clockwise. Crop: This allows you to crop, change the aspect ratio, flip and straighten the horizon of your image. There is also an Auto button which will automatically attempt to correct horizons and crop the image in. Filters: This provides a range of filter effects including some black and white filters. Interestingly the filters seem to be all or nothing, with no apparent way to adjust the effect. Adjust: This is the meat and bones of the editing section. 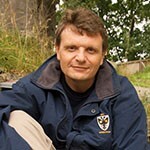 It provides by default corrections for exposure, called Light, colour and a black and white control. However at the top is an Add button. Clicking this allows you to additionally add histogram, sharpen, definition, noise reduction, vignette, white balance and level. Interestingly, both levels and white balance are listed under the Advanced tab. Retouch: This provides a familiar clone and heal tool allowing you to correct spots and blemishes. There is an ability to add and search for images based on metadata. Metadata is added by right clicking on the image an selecting File Info. This will display the basic EXIF data plus the option to add captions and keywords. Photos is still a work in progress but from an initial play around with it, it is aimed as a replacement for iPhoto rather than Aperture. However, as with FCPX there is always the possibility that Apple will constantly add features that might make it more appealing to the enthusiast photographer.